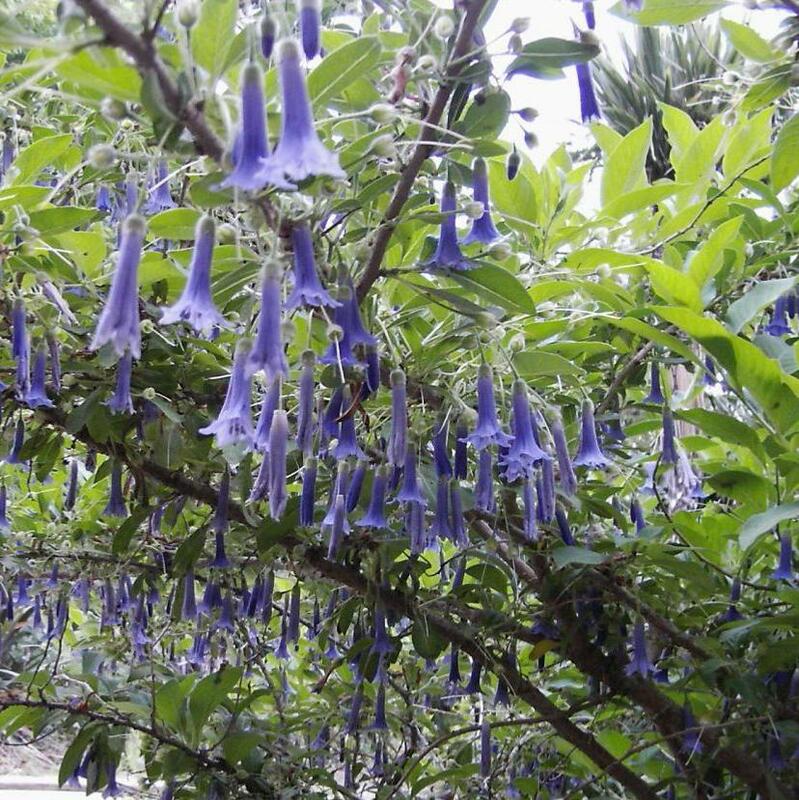 Iochroma australis is a rare and unusual Brugmansia (Datura) relative with miniature blue Angel's Trumpet flowers. This 1.8 to to 2.5 Metre shrub from Argentina becomes smothered with 5cm blooms from spring through summer, creating a huge ball of blue. In full bloom, it is truly spectacular. Iochroma australis is also one of the most confused plants in cultivation. It is sometimes sold under the name Acnistus australis, which is a valid synonym, but the correct name, at least currently, is Iochroma australe. If you want really to impress your gardening friends and neighbours you can tell them that the true name for this plant is Eriolarynx australe, because unlike true Iochroma species the flowers have hairy throats. Iochroma australe is native to the cooler areas of southern Argentina, not as the name might suggest to Australia, and is a relatively hardy deciduous shrub of medium growth. It is closely related to the ‘Angels Trumpet', Brugmansia (Datura) species, but unfortunately there is no blue flowered Brugmansia, let alone a hardy one. This is the next best thing! 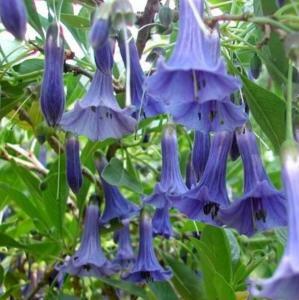 Iochroma australe is a rare plant with miniature blue Angel's Trumpet flowers. This 1.8 to to 2.5 Metre shrub from Argentina becomes smothered with 5cm blooms from spring through summer, creating a huge ball of blue. In full bloom, it is truly spectacular. Iochroma australe likes mostly-sunny conditions. In warmer areas, it is perhaps best to plant where it can get some afternoon shade, and good air circulation. It prefers moist well-draining soil and regular feeding, much like its cousins, the Brugmansias. In the right conditions it is an easy plant. The plant also litters the ground with a gorgeous carpet of blue flower petals as an after show. Iochroma australe is the most cold tolerant Iochroma and can be grown as a garden shrub in many parts of the UK. In milder gardens it can be grown as a free standing shrub but in colder gardens it benefits from the protection of a west-facing wall. If cut back by frost it will rapidly re-grow in spring and flowering is rarely affected. Iochroma australe likes mostly sunny conditions. In warmer areas, it's best to give it some afternoon shade, and good air circulation. It prefers moist, well-draining soil and regular feeding, much like its cousins, the Brugmansias (Datura). In the right conditions, it is an easy plant. Uses: Grow Iochroma australe as a standalone shrub in shrubbery situation, or as a specimen. In colder areas of the UK it can be trained to great effect as a wall shrub out of doors. It also makes a very special plant in a larger container outside on the patio, or inside in the conservatory.